Commentary: You can't go wrong with Salacious Crumb as a toy. Good or bad, it's always a neat character. The original figure was designed to sit on the throne, while the 1998 and 2001 releases shared a sculpt with tails that allowed him to stand on his own to some extent. 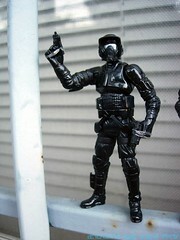 This release-- which is a redeco of a 2007 figure-- was the first to have more than one point of articulation. This version of Mr. Crumb sports jointed hips and shoulders as well as a ball-jointed head, which helps in making him look as cackley as possible. 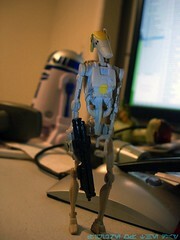 The sculpt is pretty great, and the figure was designed with sitting in mind-- specifically, tormenting C-3PO. He has no problems perching on a pillow, or near Jabba the Hutt. This figure is different from previous releases mostly in deco-- it's worth noting that this is the most ornate version of the mold yet. The head has both the upper and lower parts of the beak painted this time, and the hair is slightly darker than previous releases. It seems the paint is darker overall, and the head is also a smidgen darker than the previous one. So it's different, but it may not be different enough to be worthwhile. Since the 2007 release includes a cool C-3PO and the 2010 release includes Jabba the Hutt, I assume you'll want to make sure you buy both. 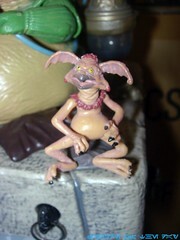 Collector's Notes: This figure is a redeco of the 2007 Salacious Crumb bundled with C-3PO. 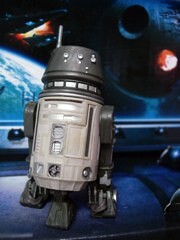 This mold is being used again for a 2011 Comic-Con exclusive boxed set of figures in Revenge of the Jedi packaging inside a big cardboard Death Star box, but exact deco changes (if any) are unknown. According to comments made at Toy Fair 2011, I was told the Comic-Con release should be identical to one of the previous releases save for packaging. Image: Adam's toy room. I think that's Mighty Muggs Prowl's box behind him. Commentary: One of the most-requested figures for an update has been Paploo. The Power of the Jedi release was done specifically to fit on a Speeder Bike and reused Wicket's body, so this one... well, it reuses another Ewok body, but it looks more normal. The head, headdress, belt, and staff are new scultps but we've seen the body a few times since 2007. Jointed at the wrist, ankles, shoulders, neck, waist, and hips, this figure has better articulation than any previous Paploo toy. The head sculpt seems to be liked by some and not by others, but there's no doubt that his gear turned out great. The staff has a lot of great detail, with a painted grip and other minor flourishes, and the headdress looks like it stepped right out of the movie... and was turned into rubbery plastic. It looks good, though! Plus the belt! Don't forget the belt, because it has a removable knife as a bonus weapon. 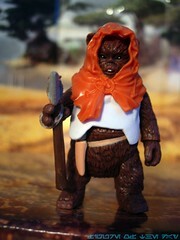 To think, this figure was packaged with a second full Ewok figure for the asking price too! 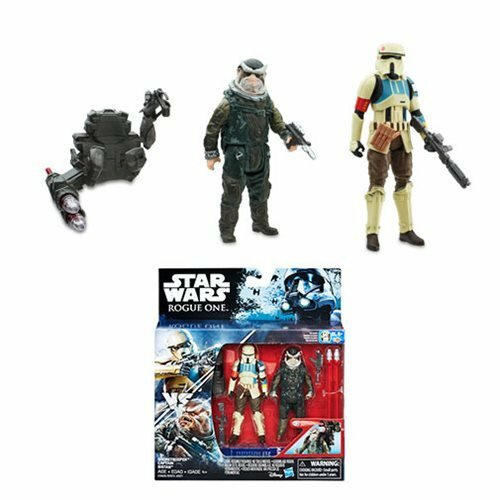 It was also the final such 2-pack to date, as it seems all new Ewoks are singles from here on out. Oh, the end of an era! I like this Paploo more than the previous release, but not as much as the first Kenner figure in the 1980s. They're all neat and good for different reasons, and I'd suggest getting this one simply because I suggest every Ewok as a worthy purchase. 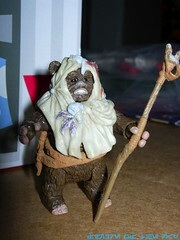 Collector's Notes: Ewok figure 2-packs always do well at retail, meaning they aren't totally worthless. If you want this set today, it'll cost you $15-$20 despite being somewhat easy to get back in 2009 when he first hit. Image: Adam's kitchen. The blue dot you can see is my work computer in the other room. 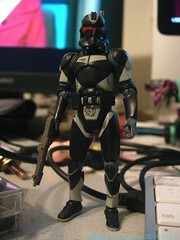 Commentary: If you're anything like me, you bought the original Imperial EVO Trooper in 2008 as part of the 30th Anniversary Collection, and then again when they repackaged it in The Legacy Collection. So why not buy him again? This time around the previously mostly-white figure has had a generous amount of brown camo added to the figure, while some of the knee and shoulder pads lost their grey coloring. I wouldn't rate it better or worse than the original release, but it certainly is different. It still has 14 points of articulation and some great gear, but the toy itself is sort of a lateral move in terms of its appearance. I personally prefer the first carded release, but I don't mind getting new and weird troopers. A black redeco would be nice, but hey, this is better than just more of the same, right? Collector's Notes: As of now it seems this set has been purged from Toys "R" Us at retail, although it wouldn't stun me if you saw some stragglers. For about $30 it's a wonderful set and is well worth your buying it. Commentary: I initially expected the Anakin Skywalker from this set to be a pre-paint, an example of Hasbro giving us a redeco before the "real" figure. The fact that we still have no Captain Typho has proven me totally wrong so far, as the outfits are pretty similar. Anakin is articulated at the neck, waist, shoulders, elbows, wrists, and hips, making him a good figure and an exceptional figure as pack-in pilots go. He can bend just right to sit in his vehicle, and the sculpt is basically exactly what it should be. The removable helmet is nice, the head sculpt is good, and the coloring ain't bad. There's some great detail in the boots, and the red plastic really looks good as it seems to have this wonderful texture that brings it to life. I like this set, and it's nice to see another "in disguise" figure for a change. It's a great way to satisfy people who want a new figure with Hasbro's desire to keep cranking out the most popular characters in new forms. Collector's Notes: I like this figure and I like the vehicle as well. These items will be packaged under a new assortment SKU and a new product SKU this August or so as Hasbro resets the line-- it should be the same toy in a smaller package. If you're a fan of the Kenner Mini-Rigs from 1981 or so through 1985, this is a must-buy. The Naboo Star Skiff feels like the best spiritual descendant from the 1980s Kenner-designed mini-vehicles, and if I could find a way to vac-metalize this cheaply I'd arrange for someone to do that. (I hear companies in China and Asia do this with Zoids kits all the time. This ship would be awesome all chromed out, don't you think?) Also, it looks like this item will be repackaged in a new 2011-style box at a lower price. Commentary: This Rebel Trooper was issued twice in two exclusive sets over the course of about three months-- that's unusual for a figure with exclusive deco. 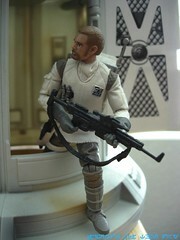 Modeled after the 2009 carded Legacy Collection Hoth Rebel Trooper, this version has a slightly lighter shade of brown for his facial hair. He's still super-articulated, and really a great addition to any army builder's collection. Actually the whole set is pretty slick, with troopers and droids plus a bunch of fun big hardware to add to your snow dioramas. The figure itself has a great sculpt with soft goods around the "skirt" region plus a working holster for his pistol, making it a pretty swell figure that really could have (and should have) been sold carded. I mean, I'm pretty sure both you and I would buy more of these. It's one of Hasbro's finer Rebel figures as of late, so if you have the chance to get him in this or another exclusive pack I suggest that you do so. You won't be sorry! Collector's Notes: This figure is pretty swell, if you like such things. Collector's Notes: The set was blown out from Hasbro/Kenner around 2000 and was available for cheap online for years. She was also reissued in the 30th Anniversary Collection line in a set of mixed Jabba's Palace Max Rebo Band boxed sets with no significant changes. As such, if you want one, you can get one. The entire set of 3 dancers now sells for about $7. I've seen auctions close for a sealed box sample of this set for as little as $4. Commentary: It's rare that astromech droids get more than one toy unless you're R2-D2, but one of the few minor robots to get the second shot at plastic was R3-A2. His first release was a repaint of R3-T7 for Toys "R" Us, but the 2009 figure had better proportions, more accurate deco, and a nice clear dome. With the wide variety of deco in astromech droids, each of the two R3-A2s are different enough where you could probably consider them different droids, so robot fans should see both figures as absolutely essential to their collections. The Saga version sold at Toys "R" Us has an orange box around his central eye, while this version has a largely clear "face." In the movie, the face was clear, so the newer one is clearly (hah) the better of the two. The coloring has gone from orange to more of a reddish orange, and the white plastic is also a little brighter. Collector's Notes: This figure was packaged with the Star Wars wave of late 2009, and parts of him were packed with 8 different figures-- some of which got to be pretty cheap on the clearance racks of 2010. I wouldn't suggest dropping more than $7 or so on him, just because the individual figures to build him should be $5 or so each-- and really, why not get yourself a whole bunch of figures? Currently, he goes for about $10. 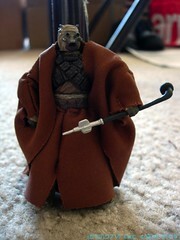 Commentary: This Tusken Raider is the great 2006 Vintage figure with new deco and new fabric elements. Rather than the wrinkly, bunched-up tan material we now have flat red material covering the figure. It looks less realistic, but it appears completely different from the previous release. The gaffi stick is a great accessory, and the sculpted elements of the figure's body are now a dark reddish brown color while the head is pretty much the same thing. The articulation is identical to the Vintage release. I like this figure-- and set-- less than I like what it represents. I'm so totally excited when Hasbro can expand the Star Wars universe with its toys, so things like Mini-Rigs (when done well) or the creation of this new clan of Tuskens is just something that makes me smile. I hope we see grey or black clans some day too, or even more of the reds would be nice. I don't think most fans are going to want these, but I find the whole thing quite exciting. Get them if you like fun! Collector's Notes: If memory serves, Hasbro said there was an even split between the "beige clan" (i.e., original colors) of the Tusken Raider battle packs and the "red clan." The red clan was the second release, and I saw plenty of both spread across multiple cities in the southwestern USA. The red clan Tuskens have not been repackaged or sold elsewhere as of yet. Commentary: When the Jedi-Con exclusive Clone Trooper set was announced, I went from infuriated to indifferent in about five minutes. "How dare they give a German convention their own exclusive!" I thought. "We're the biggest market in the world, at least share the damn thing!" 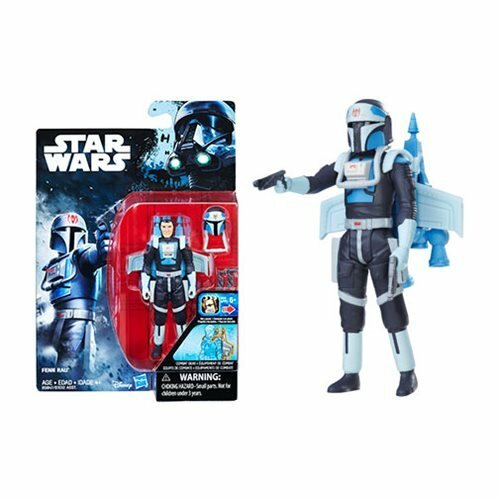 In no time Hasbro revealed this would be sold on ShopStarWars.com... and it would stay there for a few years, getting marked down, because it wasn't selling through. Collector's Notes: If you want this set, you should be able to get it fairly cheap. Do not over pay for this one unless the market demands it. Do some research first. SUPER BATTLE DROID Another Version with Painted "Jet Pack"
Commentary: I wish Hasbro would do even more repaints of the Super Battle Droid from The Clone Wars action figure line. Dropping the snap-on rocket launchers of the 2008 release, this figure takes that mold and repaints it into a striped version similar to the Mygeeto droids Hasbro put out a few years ago which were inspired by the Utapau Shadow Trooper action figures. The really cool thing about this figure is Hasbro managed to "upgrade" this figure by using paint. Not only is it a dark armored figure with stripes and a big red dot, but if you flip him over there are yellow "jets" on his back. Just by slapping on some yellow paint, Hasbro gave this guy new powers. I love that. It's such a neat design, and you owe it to yourself to grab this set to see one for yourself. 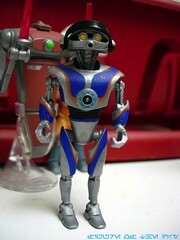 Well, that and the Retail Droid, which is basically a soda can with feet and guns. I love that too. Collector's Notes: This redeco is one of my favorites. The set itself is quite common, plus it has some clones and another droid in it. It's big fun, and I say you should get one-- but you might want to wait, it seems common enough where the price may drop on the secondary market. Commentary: In 2009, as the year was winding down, Hasbro bumped a couple of waves into 2010. The bad news is that this meant 2010 was really boring, and the worse news was that Jacen Solo and the other figures from this wave were bumped to exclusive status, shared between Toys "R" Us (which got a 30-day window) and the dotcom market. 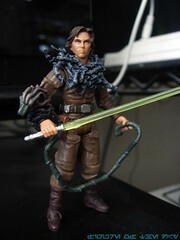 Rather than sculpt an entirely new body, Jacen uses a 2007 Vintage Bespin Luke body and gives him a new head with new gear. The darker outfit looks much better than it did on his uncle, and the added Yuuzhan Vong-inspired gear helps hide the fact that this excellent figure is 80% recycled parts. 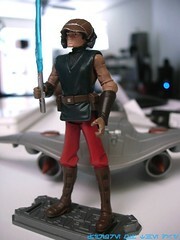 His lightsaber is green which, I guess, is fine and the junk around the figure's neck is a nice touch. It's a pretty great figure, and I'm sure fans of the novels will consider him a required purchase. As my excitement generally comes from the more visual aspects of the franchise, I was less enthusiastic about Jacen when compared to, say, K'kruhk. Collector's Notes: I think I saw one of this figure on shelves once. There was a lot-- and I mean a lot of whining about this wave's distribution at Toys "R" Us, but the online supplies seem to have been pretty extensive if you actually ordered on time. For those hunting only at brick-and-mortar, though, this wasn't exactly easy to get. Image: Adam's old neighbor's yard. The fence was low. 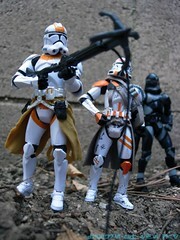 Commentary: Part of the last retail wave of comic packs, this orange Clone Trooper Lieutenant takes pieces of a few existing figures and bashes them together into this unique ranking officer. The kama is similar to the ARC Trooper one. The helmet is similar to the Evolutions sculpt. And the gun? Well, that's new. The blaster rifle has a hole in the barrel which can hold a grappling hook. It doesn't fire or launch, but it just looks cool. The figure has modified 212th Battalion orange markings, and is a pretty clean design. There aren't a lot of dents or dirty marks, making this figure look somewhat pristine. I don't consider the figure a required purchase, but if you have a need for big armies with lots of variety you need to buy this set. Collector's Notes: While this wave of comic packs tends to be somewhat expensive, this set doesn't seem to be too bad most of the time. If you can get it for roughly retail, you should. Otherwise, just settle for some basic orange clones, and you'll probably be just as happy. The most exciting thing about this one, for me, is the grapple gun. Image: Adam Pawlus' apartment's rock pile. What a wonderful amenity. Commentary: When Hasbro approached me with this wave as an exclusive for my day job at Entertainment Eart, I didn't realize that Rohlan Dyre would be the best of the wave. Truth is, I was excited to get Baron Fel with a decent head sculpt. This great ancient Mandalorian turned out especially well, with a removable helmet, amazingly detailed armor, a removable knife in his boot, a blaster in his holster, and a backpack. Really, you can't beat that for a comic pack figure. I'm surprised Hasbro didn't just hold back on him and sell him carded as a Vintage figure... it's certainly cool enough. 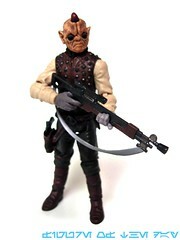 The sculpt of this Knights of the Old Republic comic book figure is wonderful. He has pits in his armor, gashes and cuts, little sculpted rivets (check out his back if you got one), loads of straps, wrinkles, creases, and other stuff. There could stand to be a little more dirt on the figure, but even as a clean release this blue and red armored warrior is pretty slick stuff. Under the helmet is the character from the comic, complete with scars. I think the sculpt is wonderful, but the painted "scar" seems to clash with the character's dark skin a little much. 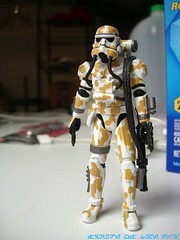 It's not very subtle, like on Jango Fett figures. He's got nice hair and a decent expression, and my guess is Hasbro scarred this guy and made him meaner as a reaction to the Mandalorians sold in the Elite Forces of the Republic set a few years ago. There's no mistaking this guy for an accountant or an engineer, the dude under the helmet is a mean warrior type. As such, he should be welcome in your collection. Collector's Notes: Hey, I sell this at my day job. You should buy one, support both this site and my employer so I can afford to spend more time writing about toys for you. I can't get too specific but it is indeed a limited edition. Commentary: In 2007, Hasbro took its Major Derlin mold and slapped on a new head. 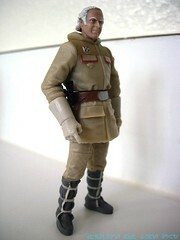 The result is General McQuarrie, another in a long line of behind-the-scenes people getting an action figure. He retains the holster, and the articulation is the same as Derlin-- 10 points, with cut joints at the wrists and elbows. While some fans took issue with the lack of ball joints, it's certainly good enough for the character. He can still man a giant gun, or hang out in front of a Snowspeeder. The uniform sculpt is adequate, combined with the texture of plastic used it looks pretty good but it's still obviously a toy. A little more texture on the uniform would probably make it feel like a better figure, but since Hasbro was reusing an existing body there wasn't a whole heck of a lot they could do to improve it other than the head. Speaking of the head, the figure also has a thermal hat accessory. I prefer to leave it off, as it doesn't fit too well and it blocks the view of the Ralph McQuarrie head sculpt. I hope we see more cameo figures as the line goes on-- we got a few George Lucas toys, maybe we can get Ben Burtt or Matt Wood next. Collector's Notes: The figure sold pretty well, although he did hang around despite shipping in only one wave. He has not been reissued and I don't expect that he will. Commentary: During the Original Trilogy Collection line most collectors got super-excited by the fact that Hasbro reissued all these great figures in really awesome packaging. (I think the OTC line packaging is better than the current Vintage line. It just looks better.) The earliest rereleases in that series were just straight reissues, but as time went on Hasbro applied new and better paint to some of its older molds. 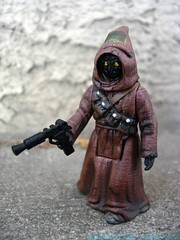 The Jawa set included two unique Jawa molds from 1996 in a set for five bucks, with new darker coloring and a black wipe applied to the mold. The light-up eye port was retained, and it tends to work really well on this mold. The sculpt was awesome for 1997 and by today's standards isn't anything too special. For diorama filler or to pack your Sandcrawler, this may be one of the best figures you can get. The figure has three (possibly four, if you can get the head to budge) joints and is pretty much only good at standing. He can try to sit, but the angle at which the legs can move and the figure's pose will prevent it from being able to actually sit down inside something. So he'll just be standing, and the big uni-leg has no problem doing that. The sculpted detail here is really remarkable, particularly for a figure that was (at the time of its release) about eight years old. 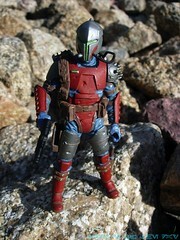 The twin pack of Jawas seems to be long gone, so you're going to need to (or want to) track this one down. It's neat, it's well-designed, and it's a quality plaything. As a packaged item, this set is gorgeous. As loose figures, this is a wonderful set. You've got no excuse to not buy it unless one Jawa is enough for you and the 2009 ones were good enough. 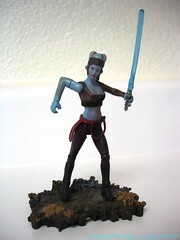 Commentary: This 2005 Aayla Secura action figure is so close to perfect it's infuriating. Hasbro did a wonderful job here, especially considering what it cost and what her peers looked like. The figure's sculpt is excellent-- her arms seem a smidgen thick but still great. Her blue skin has a little schmutz on it, and her shirt looks a little bit like leather. The texture is really nice, as is the sculpted fabric on her pants and... that flap in front of her crotch. What is that, a tabbard? Tabard? I don't know. I'm writing this on an airplane and can't check. Damn you, reliance on Google. The figure is, on paper, super-articulated and a massive upgrade from the 2002 release. Her legs are about as perfect as you can get with ball-jointed knees and ankles, the waist pivot is right where the shirt meets the belly. It's perfect. The only shortcoming here is in the arms, as the ball-jointed shoulders and swivel wrists are slightly marred by the lack of ball-jointed elbows. The head sculpt is pretty great, and my favorite feature on this one is the lightsaber hilt which can plug into her belt. Awesome. The only better Aayla figure to date is the animated Clone Wars one, because she has a ton of articulation and space gear. 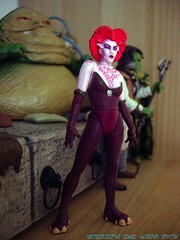 Collector's Notes: First released in 2005, this figure got a few releases in future Battle Packs. But without the cool stand. The stand is unique to this carded release, and the deco of this base was not used on any other releases of this display stand. 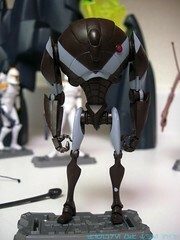 Commentary: If you can't get enough of the Battle Droid figure (or this mold) then you are going to love this one. The first of the Saga Legends repaints of this particular character, the Battle Droid Commander was exquisitely detailed and covered in dirt, yellow markings, and some silver on a few points too. Basically, Hasbro peaked as far as this mold goes in terms of deco right here. I wish they'd apply it to the new, even more poseable molds. For those of you keeping track, this is the mold which came off the 2002 "Deluxe C-3PO with Battle Droid" set. The head, arms, and legs pop off at the joint, plus there's a backpack. 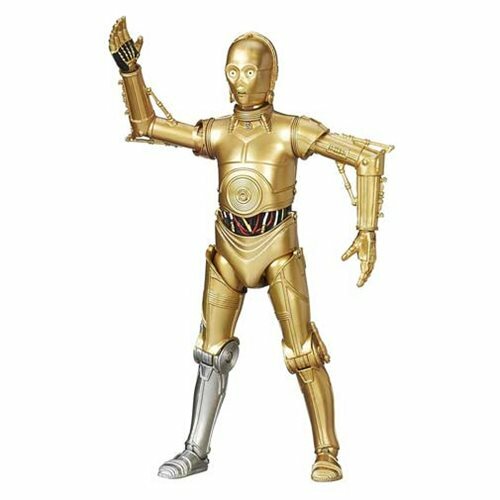 You can swap limbs and make junker droids too if you want... and I think you do want. 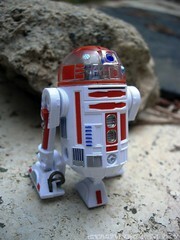 Get this one, if you only get one Saga Legends Battle Droids pack, make sure it's this one. Collector's Notes: This set shipped on and off for a while, and the price on eBay seems to be going up-- somewhat unusual for Saga Legends. If you can get this set for $10 or less, I'd say you should make sure you get one. Or two. It's a nice set.